Dr. Kristi Bernhardt (formerly Kristi Crass) has been practicing small animal medicine in the Madison area since graduating from the University of Wisconsin School of Veterinary Medicine in 1998. She joined the Whole Pet team in May 2015 and has a strong interest in behavior. Dr. Kristi loves working with the very young, very old and everyone in between. 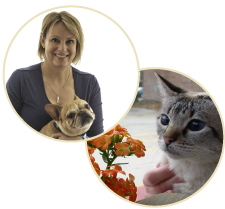 Dr. Kristi lives in Madison with her husband, David, two sons, Sam and Theo, two dogs, Waffle and Chug, and cat, Kitton. On her free time you can find her traveling, reading, and doing anything outside.